As a guitarist, there were instrumental features that I always wanted to explore that were against the nature of the instrument. The explorations began with extended techniques and prepared guitar but could never get the flexibility I desired. timbrel shifts and non-exponentially decaying envelopes were a few of these features. I had always been enthralled with the color palette and possibilities of wind instruments and bowed strings. In 2005 I became aware of the work of Michel Waisviszz and STEIM. I was inspired by the intuitive nature of his instrument “The Hands” as well as the instrumental and musical performance techniques. This instrument was truly an interactive instrument not a hardware controller. Prior to this exposure, I had been focused on interfacing with computers through artificial intelligence and automation with minimal direct user interface. I had no experience with hardware design, let alone instrument design. STEIM introduced me to the possibilities of game controllers and I began to experiment with these. They were affordable, accessible and, with some basic soldering skills, flexible. I began to attempt to develop interfaces and software that were intuitive, flexible and spectrally interesting to my aesthetic. Furthermore I wanted to make something that was affordable. This is, in part, a practice result of my financial situation but also a result of becoming more involved in the open-source community. I worked with computer mouses and other consumer computer interfaces. The gamepad always had certain flexibilities that appealed to me. The combination of discrete buttons and dynamic controls such as the little joysticks offered very musical possibilities. First attempts with gamepads had some gesture recognition but was often little more than a controlling interface. This is very similar to any other MIDI controller. Eventually I developed more instrumental interfacing with joysticks, which led to the current instrument. The design of the Strombophone’s physical interface was experimented with beginning in 2005. implementation began in 2009 and was completed in 2010 with the help of John Stewart Jackson. Simply put, the instrument is a combination of 2 logitech game controllers and a single wii controller. The controller is held with the wii facing the player. 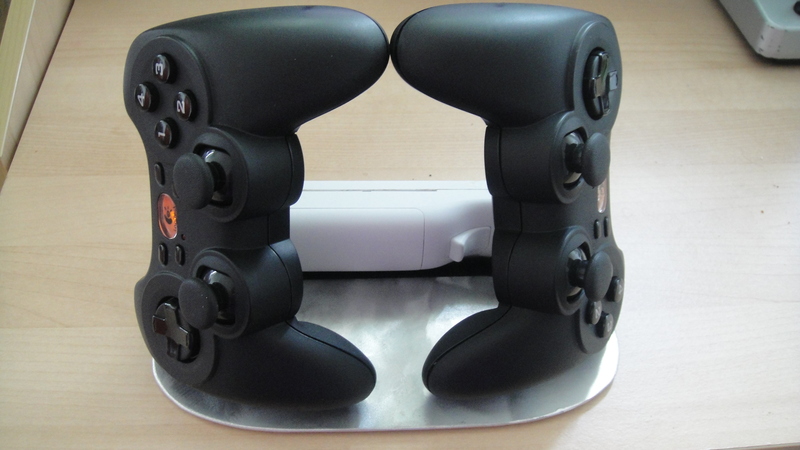 Each of the joysticks on the controllers are played with the ring fingers (lowest joysticks) and index fingers (upper joysticks). The metal place should face up. The Strombophone is designed to be an intuitive interactive instrument that attempts to emulate the color possibilities of woodwind and string instruments. It is not an emulation of these instruments, rather an electronic reconceptualization of the possibilities available with these instruments. The hardware for the instrument aims primarily to be thought of as an instrument not as a control surface. The instrument is the result of years of research into synthesis techniques and human computer interaction. 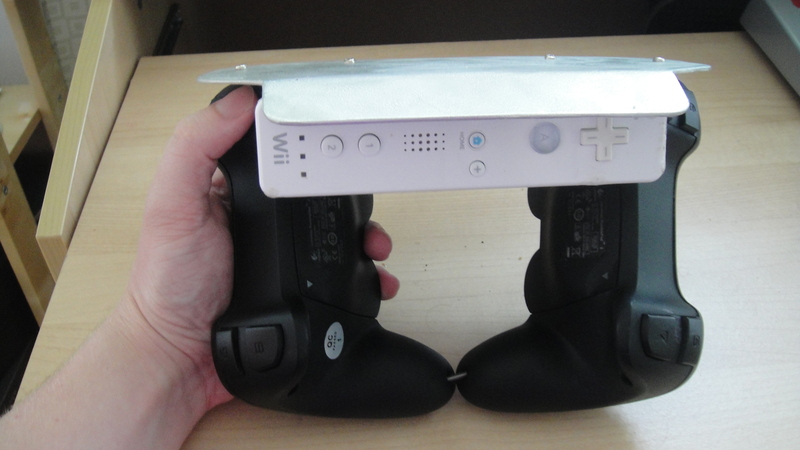 The hardware consists of two game controllers and a wii. Ergonomics were of great consideration to combine comfort and efficient and complete use of the hardware interface. The software is designed in Puredata, an open source dataflow programming language created by Miller Puckett and developed by a community of users. The software created consists of an interpretation program (musically interprets the data from the user gestures with the hardware), a realtime granular synthesizer (bell-granular synthesizer [Dirk Johan Stromberg]) and a physical modelling synthesizer I created (a hybrid of a the research done by Perry Cook and Eric Lindemann [Synful]).